Welcome to our Cryp1 File Virus removal instructions. This article intends to help you remove Cryp1 File Virus from your system and is designed to work for all Windows versions. Dear reader, if you are reading this article, you might have been looking for solutions to your recent technical issues. Most probably something has made some of your files inaccessible and you are trying to get them back. If this description applies to your case, you are most likely to have been infected with .Cryp1 File Virus. In the information below we are going to further explain the behaviour, origin and effects of this virus. What’s more, we will give you some tips on how to avoid it and deal with it in an efficient way. As you may have concluded from its name, Ransomware is a malicious program that locks up some of the victimized users’ files and then demands ransom to be paid for unlocking them. It was first developed in Russia and since then has quickly spread worldwide. Ransomware is indeed so nasty that it has become an unpleasant issue for a great number of users ever since it first appeared. Unfortunately, Ransomware frightens the users all over the world so much mainly because when a user finds out their machine has been contaminated, it is usually too late. The main symptom of a Ransomware infection is a strange full-screen message that appears on your computer screen, stating that some of your system’s files have been encrypted and you need to “purchase” an encryption key if you want them back. Also, it is possible that the whole encryption process uses up a lot of your device resources so that its performance is noticeably more sluggish. Actually, this is the very moment when you can notice that something bad is going on with your computer. If you are experiencing a substantial slowdown, make sure that you check your Windows Task Manager. There on the top of the working applications, you may find one with an unrecognizable name. This is most probably Ransomware. On such conditions, turn off your system and consult a specialist or a removal guide like the one we have prepared for you below for further instructions. How did you catch Cryp1 File Virus in the first place? If you are still reading this article and the information above explains your case, you have been infected with .Cryp1 File Virus. However, how exactly did you get it? Typically these viruses travel with a companion – a Trojan Horse virus. Their most usual destination and the place where they love to lurk is inside letters from unknown senders in your electronic mail. This is where they are most likely to be found and where you must have caught them. Nonetheless, it is also possible that they can infect whole websites and get distributed by opening such a webpage or by a link redirecting you to one. Please, always remember to deal with the Trojan as soon as you have managed to remove the ransomware to prevent any additional damage to your machine. Cryp1 File Virus is a Ransomware program and functions as such. It infiltrates your system with the help of a Trojan. Its way of working is the following – as soon as it has entered your computer, it starts preparing a list with the files you most commonly use. After it has completed that task, the ransomware begins to lock up those files one by one. In this way your preferred data ends up inaccessible and encrypted. 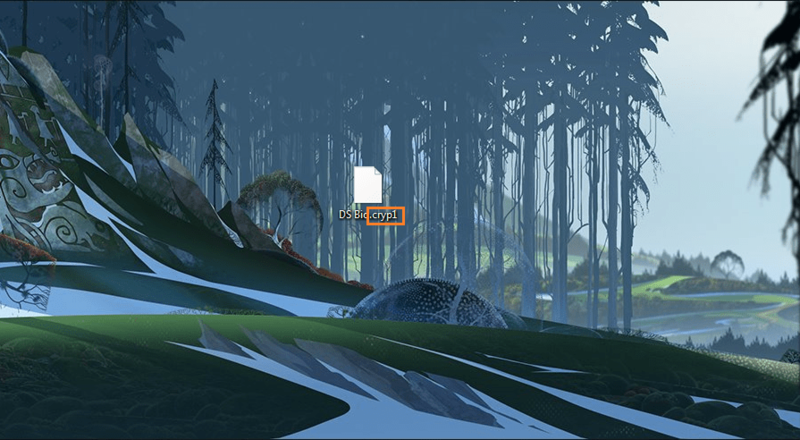 Then a full-screen notification is generated that informs you about what has happened to your files. Of course, this message contains information about the ransom you are required to pay and possibly about the payment methods. Is there a chance to avoid Cryp1 File Virus or remove it after it has already infected your system? Fortunately, to prevent .Cryp1 File Virus from infecting your system is easier than to deal with it later. There we will give you some basic prevention tips that will help you ensure your online security. First of all, avoid webpages, websites and letters in your Inbox that don’t appear trustworthy to you. In this way you will make the chances of catching Cryp1 File Virus smaller. Remember to regularly update your firewalls, anti-malware tools and to check your Task Manager for possibly shady operations taking place. Also, be careful with any unusual slowdown your system may encounter. Nonetheless, if you have already been infected with the virus, what we can advise you is NOT to rush into paying the demanded money. Make sure that you try to deal with the problem without surrendering to the hackers’ blackmail. The guide below may come in handy to you if you want to get rid of this threat. However, no one can guarantee that the access to your files will be given back to you even if you remove the virus and even if you pay the ransom. High. Extremely Dangerous and damaging. Negative Effects The encryption of your files with the .cryp1 file extension. Locate any suspicious processes associated with Cryp1 File Virus. Right click on the process = > Open File Location => End Process = > Delete the directories with the suspicious files.